Treasures of Troy is one of those slot machines that I never really gave the time of day until recently. I found the independantly rotating symbols a bit odd to start with, but a good friend of mine convinced me that it was a very good video slot and I should give it another go. I am glad to say I did and it has since become one of the first slots I go and play in the casino. 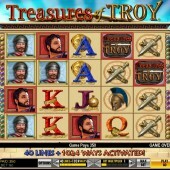 Online and land-based slot developer IGT, who make Treasures of Troy, have also released an online version of this slot. It stays reasonably true to its land-based predecessor but whether it can stand the test of time like its land-based version remains to be seen. I, for one, am certainly hoping that it does because this slot has a little place in my heart after my land-based ventures with it. 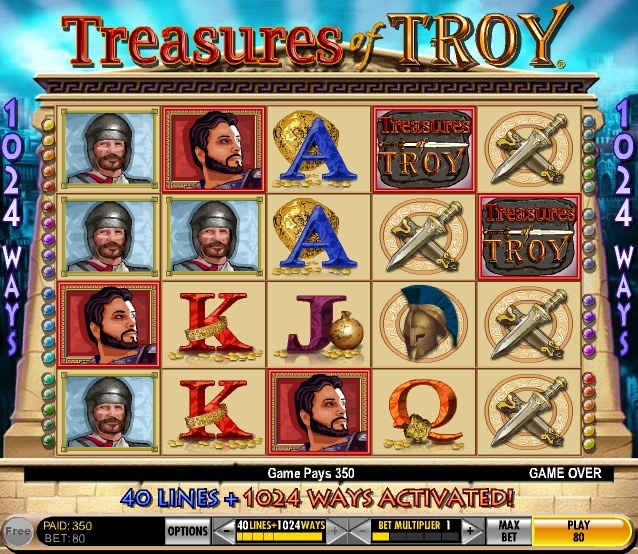 There are a staggering 1,024 winning lines in Treasures of Troy, which has IGT's patented Multiway system in use on the reels. This is also available on the oriental-themed Triple Fortune Dragon slot, but few other online slots have it. The bonus round can be very rewarding in Treasures of Troy, with free spins and a multiplier awarded when you see 2 or more wooden horse scatters on the center reel. 2 scatters gives you 10 free spins at 2x, 3 with give you 15 free spins at 3x and 4 will give you 20 free spins at 4x. The great thing is that this can retrigger several times during the feature, which can give you some big wins. Treasures of Troy is truely a unique slot, with its unusual independant spinning symbols and game sounds like no other. But, if you fancy something different that can still give you great rewards then this is the game. I can only think of alluring White Orchid slot that is similar in style, which is also a lot of fun.